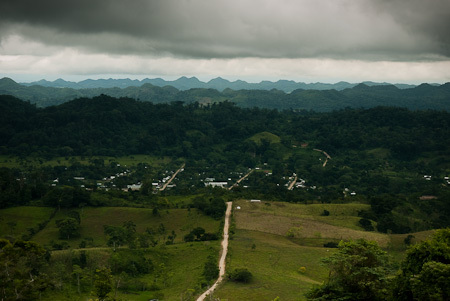 We could have rushed back to the Guatemalan highlands to continue our journey there, but having consulted the weather gods (cold, miserable deluges forecast in the mountains), we’ve decided to cross Chiapas’ lower lying Sierra Norte range and head back into the jungle-clad north of the country. As routes go, it’s just as interesting. 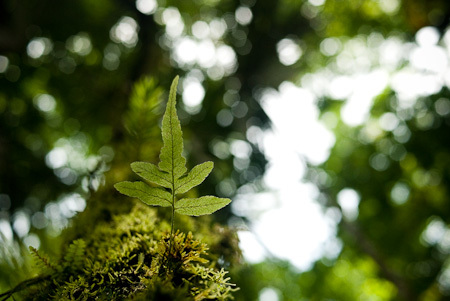 Lush and mountainous Chiapas is one of Mexico’s most varied states – politically, culturally, historically and scenically. From Comitan, our journey took us up to the cobbled and colonial town of San Christobal de las Casas, before following a rolling mountain road to Ocosingo. 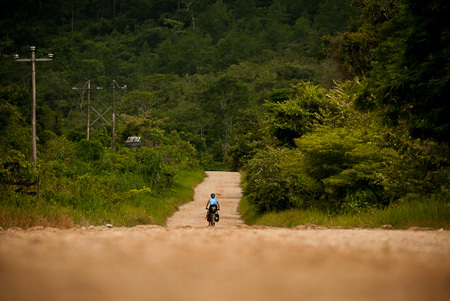 There, we were able to steer back onto dirt once more, on a track that wended its way through the heart of Zapatista country – home to autonomous regions that emerged from the indigenous uprising sparked by Mexico’s signing of the North American Free Trade Alliance in 1994. 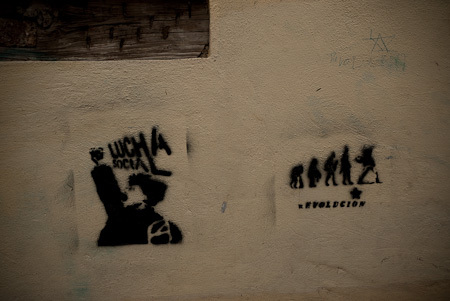 Stencils in San Christobal de las Casas, a historic, artsy town that, despite its popularity on the backpacker and tour group circuit, still manages to retain a political edge. One of my favourite places in Mexico. With promising dirt road information at our fingertips from our one-toothed friend, we stocked up on some supplies from the market and prepared for the road ahead. Our route begun with a stint on pavement; thankfully, we skirted round the worst of this wall of mountains that rose ahead of us, morning mist haloing its ridges. Then pavement gave way to dirt, though by the looks of things, a carpet of asphalt is on its way. Despite the advantages this can bring to remote villages, I’m convinced the negative impact of more cars is always underestimated – faster, more dangerous traffic can change the whole social dynamic of a small, closely knit community. 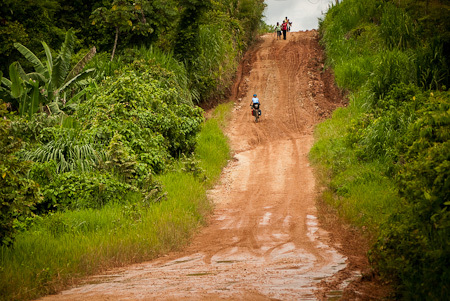 Dirt roads act as the perfect speed deterrent. 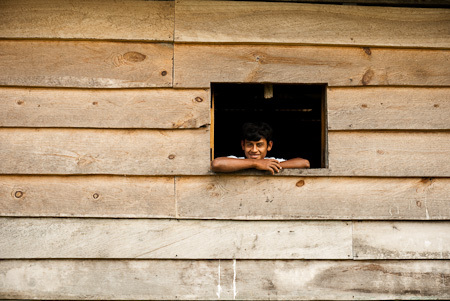 Still, there’s a while to go yet… Within just a handful of kilometres from busy and rowdy Ocosingo, the whole feel of the place changed, with villages made up of little more than clusters of thatch-roofed huts set amongst dirt clearings. 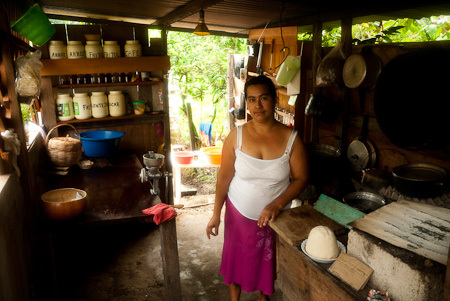 Chiapas is one of the richest states in Mexico in raw resources – including gas, oil, corn and coffee – yet it’s said that around 80 per cent of the indigenous communities lack access to clean water, hospitals or electricity. 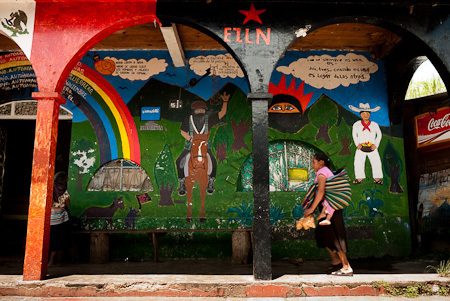 Nuevo Jerusalem, an autonomous village that answers to one of the ‘karakols’ – as the Zapatista government is called – rather than the Mexican federal system. 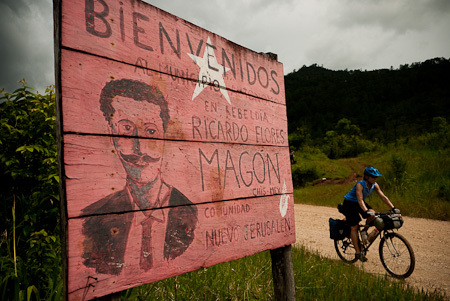 A journalist and politician, Ricardo Flores Magon was one of the intellectuals of the Mexican Revolution. Just the kind of roads we like. 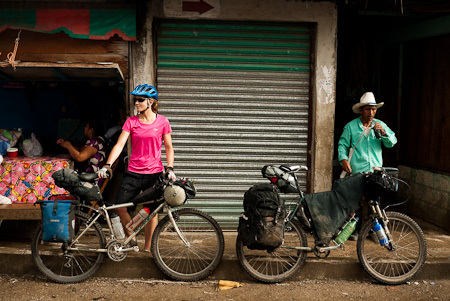 Almost free of traffic, the pueblocitos we passed through seemed particularly friendly and welcoming – almost everyone we passed flagged us down for a chat, asking us where we were from, and where we were heading, amazed that we were travelling by bike. The general assumption was that we were both Americans, and I always had to explain that England lay beyond the Atlantic. One kid even asked: cuantas horas caminando? How far is it by foot? Heads appeared out of hatches; lots of smiling and waving. Palm fronds drooped above us and a palette of lush greens enveloped the empty road, which meandered through one valley after the next. These roads were indeed quiet. Quiet enough that boney hipped dogs could curl up in potholes to nap (roused only into action to take chase as we passed), and chickens and turkeys could peck their way freely from one yard to the next. Plumes of smoke wafted out of kitchen doorways as tortillas were hand slapped into shape. More than once, we saw young families taking a stroll, the women holding umbrellas over their shoulders, both for the beating sun and the sudden downpours. Only the occasional gang of cheeky boys, yelling ‘Gringo, Gringo!’, vying for our attention as they mimicked our voices, interrupted a perfect scene. More murals, this one painted on the side of a community centre. Subcomondante Marcos, of the EZNL, and Francisco Zapatista, after whom the group is named, a key figure in the Mexican Revolution. 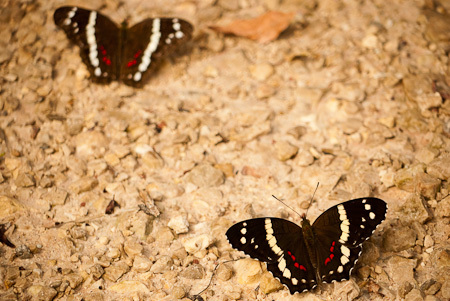 Butterflies of all sizes and colours danced around us as we rode, settling in large groups along the track. 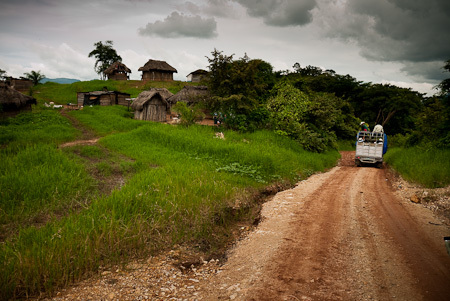 Communal pickups are the main form of transport around here, loaded high with both people and boxes of supplies, shuttling between Ocosingo and these remote villages. The man in the white vest is just about to pull a classic Mexican move: rolling his T shirt high above his portly belly is the perfect way to cool off in these sub tropical climes. Included in every discerning Chiapatista’s attire: a cowboy hat, massive belt buckle, a machete swinging from the hip and a pair of well worn wellington boots. 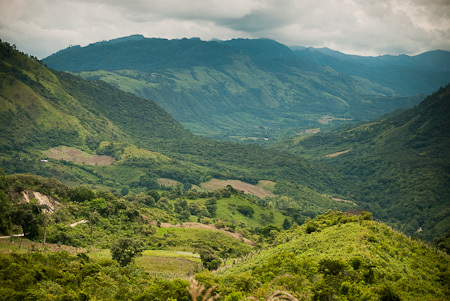 Chiapas view; our road is on the far left, set amongst the green folds of this rugged land. Conditions were a little muddy, but way better than we expected. This was blissful mountain bike touring. Various bright and colourful flowers competed for space amongst the jungle tendrils, their aroma mixed with sprigs of lemongrass and mint that grew wild amongst the foliage. 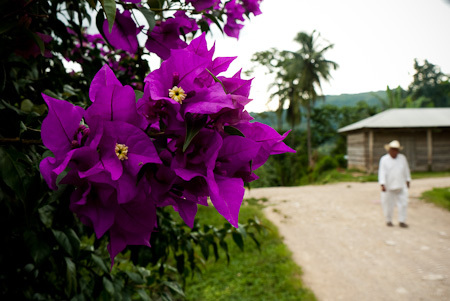 An hour away from Monte Libano, we experienced Chiapas pride and hospitality. How often does a man get out of his car, shake your hand and invite you to his house, even though he’s not going to be there that evening? This is Emigdio’s wife, who reacted to our unannouced arrival without a murmur, setting us up with a place to spend the night. 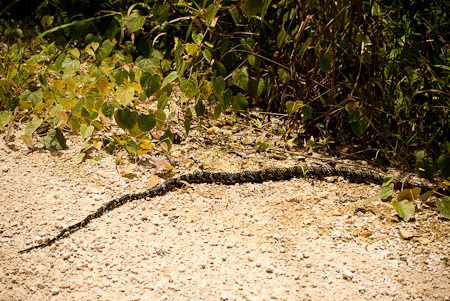 These mountains are scattered with literally hundreds of Mayan ruins, long blanketed beneath jungle tendrils. 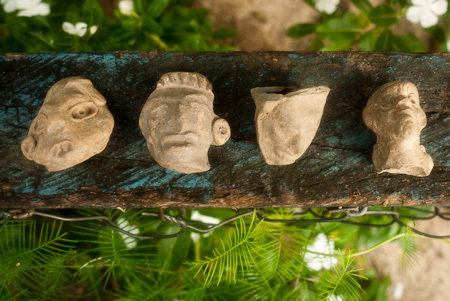 Emigdio’s father in law, Jorge, had a collection of artifacts he’d found over the years. He proudly showed them to us, in the hope we might buy one – having quizzed us on each and every part of financial life in the UK. 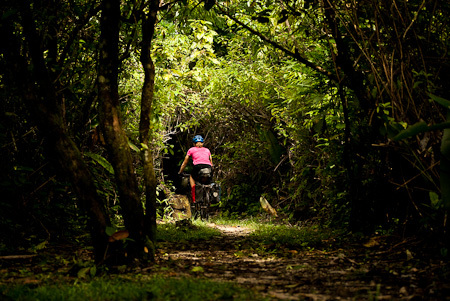 After a winding climb out of Monte Libano – whose gradient seemed almost flat compared to our toils in the Guatemalan highlands – a moment of singletrack led us down to the shores of Laguna Naja. 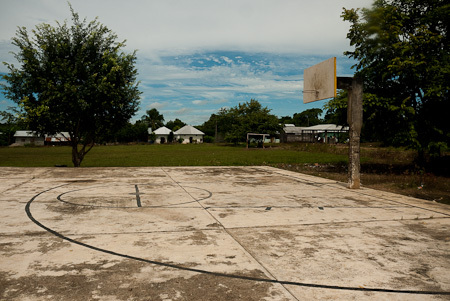 This area is home to the Lacandun tribe, who wander around in ankle length white robes and long, untamed hair, and are said to be the last direct descendants of the ancient Mayans. 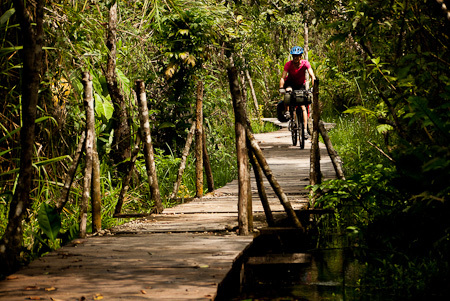 … some sweet boardwalk riding too, along a jungle path that forms part of an ecotourism initiative in the area. 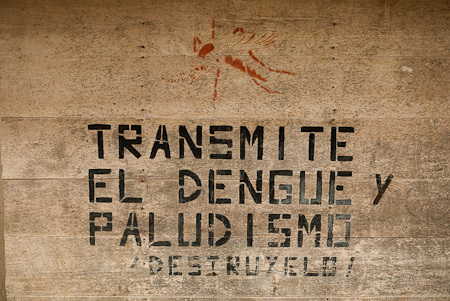 A stencil on a health centre wall, warning about malaria and dengue fever. Jungle detail. As I stopped to photograph this leaf, the air was filled with the soundtrack of the high pitched, chainsaw buzz of jungle bugs hidden in the forest canopy. 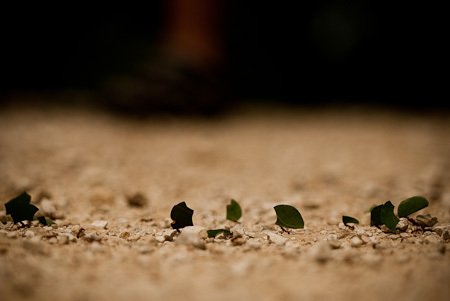 An army of industrious leafcutter ants. These little fellas always tidied up after us, tracking down each and every biscuit crumb we left behind. They bit hard if we got in their way. Right up until we reached El Jardin, villagers we met insisted we wouldn’t be able to make it across a recent landslide – apparently not even horses could get through. Here’s Cara hoisting her bike effortlessly over to general amazement. 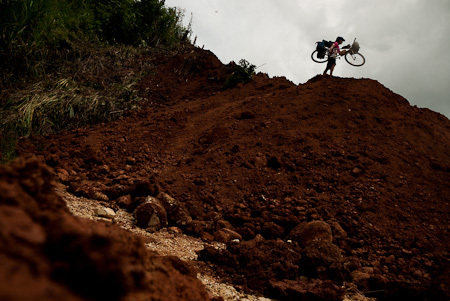 As we crested our last climb, brooding skies and a long dirt road descent lay ahead towards the settlement of Sibal. Some 120 incredible kilometres from Ocosingo, we hit pavement again. Unwelcome house guest. 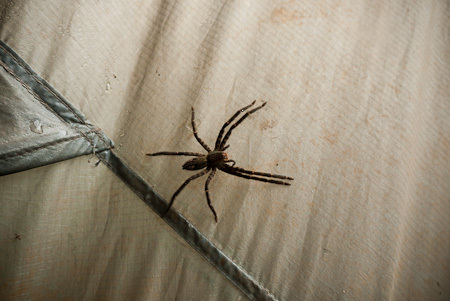 Luckily on the outside of the tent. Not much happening at La Frontera Corozal, on the Mexican border with Guatemala. 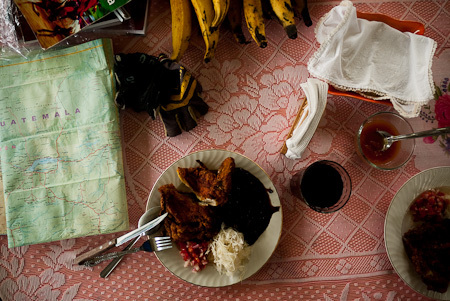 Our last meal in Chiapas was also perhaps our best. A set menu in what was basically the kitchen of a house, where a sign painted on the wall read: comida economica. Cheap food. Roast chicken, rice, a tomato salad, a stack of tortillas and a huge pitcher of Agua de Jamaica (juice made from the flowers of a hibiscus). All for 3 dollars a head. 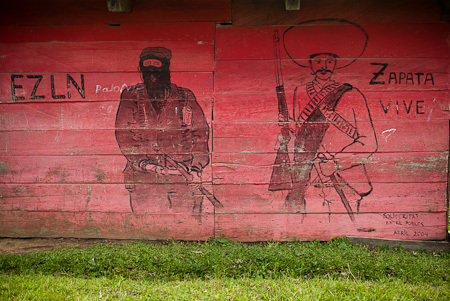 This entry was posted in Mexico and tagged Chiapas, Monte Libano, Ocosingo, Zapatistas on September 8, 2010 by Cass Gilbert. Glorious photos once again. Glad to see the revolution there is still going strong. Althougn the big mystery to me is how you can go through so much mud but Cara still manages to look like a model in a commercial for a new brand of detergent…..! Progress is overrated. Much more to be gained by wandering. Stellar work as always Cass. Are you still shooting with a little camera? These look great. What an amazing trip! I’m hoping to do something similar, and I can’t find all of your route on my map. Could you fill in some of the places, and road names? Thanks so much for your beautiful photos and great blog! Hi Jen, I don’t have a map of Mexico handy, but googlemaps shows the beginning of the road out of Ocosingo. I don’t recognise the places listed, so the easiest is simply to start out on the road to the ruins of Tonina. Then it’s just a case of asking for Monte Libano, the main settlement ahead. We were invited in for the night, though we could have gone further. 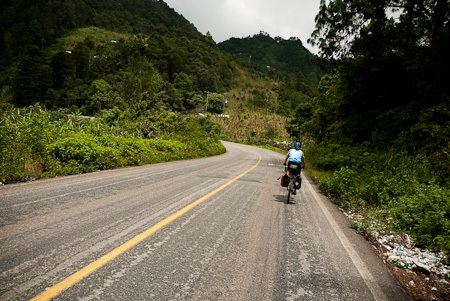 From there, there is a climb, from where you can take a detour to Laguna Naja (down a dirt road descent) which isn’t a must-see, but it is interesting and weird. Back at the junction, head for El Jardin and Sibal, from where the pavement begins. It’s best to check directions with any truck passing by. A crew were working on the road at either ends, so it’s possible more is paved now. 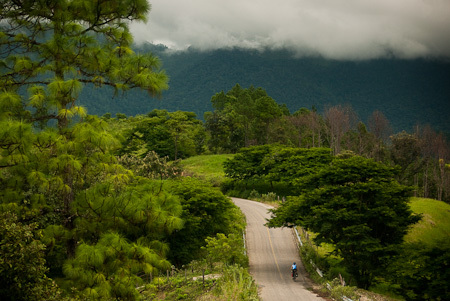 Pavement will lead you to the main junction, from where you can either turn towards Palenque (a nice, chilled out ride), or to Bonampak, from where you can cross the border into Guatemala at La Frontera Corazal. Thanks so much for your reply, Cass… I have a few more questions. 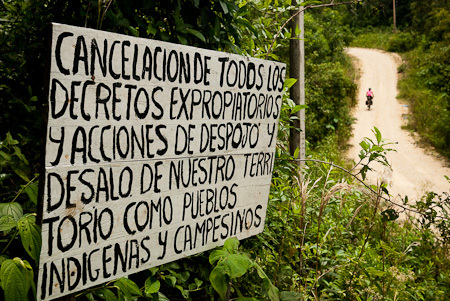 As I’ve been looking into the ride more, I’ve been hearing about roadblocks and bandits in Chiapas. How secure did you feel moving through, and camping in that State? Did you talk to cyclists that had any issues? Also, how was traffic in the paved areas? 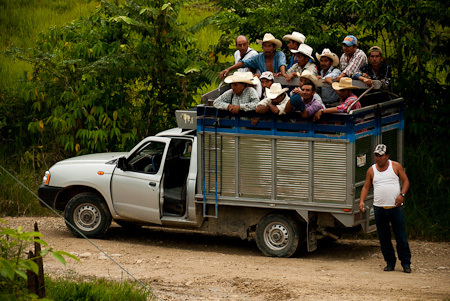 As to traffic, very little on the road that runs along the Guatemalan border. More obviously close to the bigger cities.